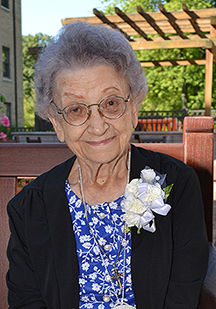 DAYTON — A Memorial Mass for Precious Blood Sister Rosalie Kastner will be at the Salem Heights chapel, 4960 Salem Avenue, Dayton, Ohio on Monday, April 1, 2019 at 10:30 a.m. Visitation in chapel begins at 9 a.m. followed by the Sharing of Memories at 10 a.m., immediately preceding the Mass. Sister Rosalie died at the Maria-Joseph Center in Dayton on Thursday, March 28, 2019. She had been a Sister of the Precious Blood for 81 years. The daughter of Joseph and Theresa (Planner) Kastner was born in Dayton, Ohio and given the name Theresa. She was the third oldest of their four daughters. She also was the stepdaughter of Paul Brechtel. On August 15, 1937, Theresa entered the Sisters of the Precious Blood and received the religious name of Sister M. Rosalie. Sister Rosalie taught 46 years in elementary schools in Arizona, California, and mostly in Ohio. She left a lasting impression as a fine teacher and a caring thoughtful person. During her early years in retirement, she volunteered as teacher aide and in other ministries. She was still spunky and full of life in her later years. She retired to Salem Heights in 2009. With increasing health problems Sister moved to Maria-Joseph nursing center and later died on March 28, 2019. Preceding her in death were her parents and her sisters: Helen Kastner, Irene Schommer and Lucille Fischer. She is survived by her Precious Blood Sisters and her nieces and nephews. Funeral arrangements are by Baker-Hazel-Snyder, Daton.